This feature provides the ability to build dynamic forms through the use of bindings. A binding is an expression made of field values as they exist on client side when the expression is evaluated, and which affects the form state on client side, thus creating forms that dynamically change based on user input. More specifically, there are expressions that can control field visibility or the value. Behind the scenes, Action Form uses the popular Angular JS library, but we’ve implemented a layer that would provide the more familiar syntax which is the field name between square brackets (eq [FieldId]). These expressions are implemented on top of Angular JS data binding mechanism. Besides field value, you can invoke any JS function. For example, show a Continue button when the zip code length is 5 using this expression: [ZipCode].length == 5. Or, show it if a field is a number: !isNaN([Age]). The ability to use the JS Api is what gives limitless potential to Action Form binding expressions! Inside expressions you’re limited to using operators only. You are not allowed to use control structures, to declare variables, functions and so on. You can however use the On Click/Change binding where you have full syntax. We get this often on support: “Why can’t I bind using [User:FirstName]?”. The answer is simple: these tokens live on the server side. We manage to fool some with this answer, but others are more alert and come with this clever question: “Ok, but what about [FormFileId] syntax? It works in binding expressions and pretty much everywhere else”. Well, like mentioned earlier, we did extra work to implement this layer on top of Angular JS to translate [FormFileId] from tokens to angular specific code like form.fields.FormFieldId.value. But we’ve only done it for form fields. Invoking all tokens just to export them to JS would be overkill. But that doesn’t mean you can’t do it. It’s just that you have to do the work yourself. One way to do it is with Hidden Fields. Add one such field to your form and input the token in the value field. Now you have it on client side and can use it in expressions via the hidden field, pretty much like any other field. Notice the using of this keyword. It refers to the Angular JS scope. Every time you use a variable in an expression, it’s fetched from this scope. So now that we’ve placed myUsername in the scope, we can later use it in an expression just by its name. So one field could be made visible with the following expression: myUsername == ‘host’. Here are a few different scenarios that use this binding. The multiple choice field allows administrators to provide a list of items. The expression need to compare against the item value. You have to pay attention to this only when using the pipe syntax to provide both a text and a value for an item (for example Item Text|value here). Here’s an example: [MultpleChoiceFieldID] == ‘Some Value’. Important! Hidden fields do not get submitted to the server. This is because the show binding is commonly used to create conditional logic, where only the visible fields make sense to be filled in and sent to server. This binding is used to auto determine in realtime(only based on data available on front-end) if the field is enabled or not. As for all the bind expression conditions you will not be able to use MyTokens tokens as they will be evaluated only once, at form initialization. The setting was added in Action Form 5.0.519 and is available in all following versions. This is the expression that you would bind to the Display Name field. It simply concatenates the First Name with Last Name and separate them with a white space. The field will update automatically every time first name or last name fields change. But there is a catch. Once the user “touches” the Display Name field the value is no longer updated automatically. Currently there is no way to reactivate the binding once that happens. If you do need to do this, then take a look at creating the binding manually in the On Click/Change section further down on this page. [Sync] ? [Source] : “”. This simply says “If Sync is checked, then use the value from Source field, otherwise use nothing”. There is a video on this example at youtu.be/iOjGys1NVmg and also some files that you can find attached to this page. All this does is take parts of the ID fields and concatenate them together but in a different order and separated by a hyphen. This is somehow cleaner code and it also bypasses the Action Form mechanism to break the binding after the Target field is “touched”. It also allows for more advanced processing so values can be compared, iterated, parsed and so on before being bound again to a field. There is a video on this example at youtu.be/iOjGys1NVmg and also some files that you can find attached to this page. More services are available in Angular JS, but not all of them are exposed by Action Form. Write to us below in comments or via email if you need more services. 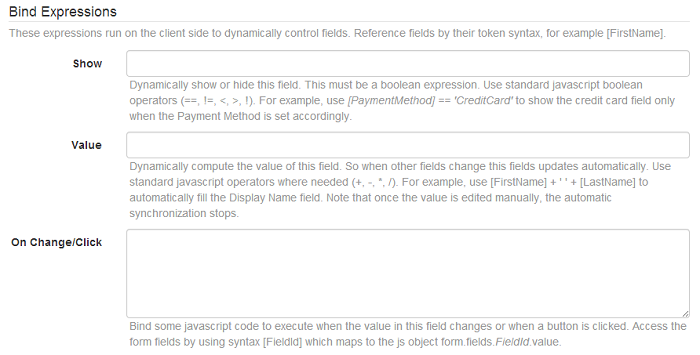 What this does, it adds a class to a field when it changed and the Sync check box is ticked. Note the use of this in this context refers to the form field that generated the change event.